You've been asking for it and now its here. Finally a quality FM antenna at a reasonable cost. 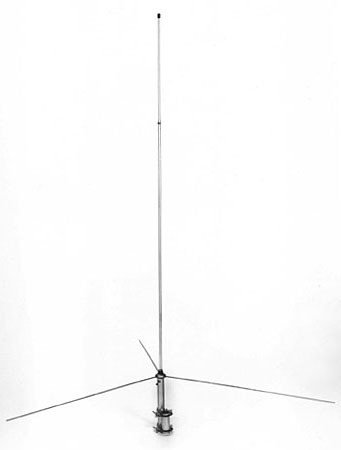 The Comet 5/8 wave antenna is professional quality, commercial grade antenna that offers 3.4dBi of gain. Designed with needs of the low power broadcaster in mind, the model CFM-95SL provides exceptional quality and performance with an unbeatable price. This antenna comes with our Precise manufacturing and excellent technical characteristics make this antenna a recommended aerial for all MAX series FM transmitters. Length: 4'8" - 6' 1"
This aerial is shipped from within USA! To purchase a SWR meter or coaxial cable check under accesories! Our choice for broadcasts of up to 300 Watts. Weather sealed for long term durability in all climates. DC short for lightning and static protection. Comes supplied with boom arm. 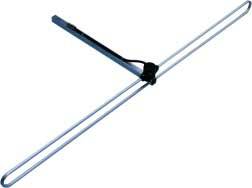 The folded dipole is the perfect antenna for stations that require a truly professional antenna for their broadcasting. No tuning or adjustment is needed for any frequency on the band which makes this antenna the only one to use if you plan to move your transmitters frequency often. Completely hermetically sealed with a full all weather warranty - you can be sure this antenna won't let you down, making it our choice for commercial sites where access is difficult. For higher power handling you can stack these antennas with the 2 and 4 way phasing harness' to make 2 and 4 bay antenna systems easily handling over 1KW of power. This is a redesigned standard 3/4 wave antenna to provide even higher gain. Preliminary testing of the antenna indicated a small increase in gain could be seen when the main radiator was made a little longer then the calculated 3/4 wavelength. This adds inductive reactance to the antenna and a few tenths of a db in gain once the gamma match has been retuned to 50 ohms impedance. We knew the increase in gain would be small by making the antenna longer and if we passed the optimal length, we would destroy the antennas performance altogether. We decided it would be worth the time to conduct further field tests and find this ideal length to extract every last bit of performance possible from any single omni directional antenna offered on this band. Using our exclusive formula we can now calculate the ideal length that provides maximum gain based on our customers frequency. High performance 3/4 wave antennas are not typically seen on any band because the 3/4 wave presents some interesting problems when it comes to impedance and angle of radiation. The typical 90 and 45 degree downward radials used on most smaller ground planes are capable of providing a good 50 ohm impedance but they also give a very high angle of radiation when used on the 3/4 wave. This wastes the added gain of the 3/4 wave by allowing a good deal of your signal to go up rather then out. Our innovative cone shaped ground plane structure on the 3/4 wave overcomes this problem and will refocus the energy so that it projects out into the distance and not up into space. A quick look at the picture showing the radiation patterns will make it easy to understand how this affects range when compared to other antennas. Our 3/4 wave has an impressive gain figure better then 6 db over a half wave dipole and more then 9 db over a circularly polarized antenna. The typical 100 watt LPFM station using a circularly polarized antenna has to run the transmitter at about 225 watts output in order to achieve the 100 watt ERP level because the CP antenna has -3.2 dbd. Since our antenna has a power multiplication factor of four times you would only need 25 watts of RF to reach the full 100 watt ERP level! This can provide a significant savings since many exciters produce 25 watts and would not require the expense of an RF power amplifier. The antenna uses a highly efficient Teflon insulated gamma match that eliminates any coils or matching transformers and allows us to shunt feed the 3/4 wave main radiator while keeping it DC grounded for added lightning protection. Another advantage this antenna has is it's ability to handle high power levels. The weakest link in the chain is the coax connector and our standard model offered in this auction uses a gold pin Teflon insulated weatherproof N connector recommended for up to 1 KW. A simple $50 upgrade using a 7/8 connector brings the power handling to 2.5 KW. For commercial operators seeking an excellent backup antenna that can handle full power we offer a special order 10 KW version. This model replaces the gamma match with a sealed Jennings vacuum variable capacitor and uses an EIA flange connector making it virtually impossible to burn out. Your antenna will be precisely tuned for your frequency and shipped assembled so you get a perfect SWR match. You simply slide the telescopic main radiator sections out of the base to the premarked spot, tighten the stainless steel clamps and connect the coax. Complete instructions are included for easy retuning in the field should your transmit frequency make a major change in the future. We have invested lots of research and development time into this antenna and are willing to stand behind it with a great guarantee. If the antenna you use now didn't cost thousands of dollars, replace it with ours. If anything should fail within two years send it back for free repairs or retuning if you would rather us do it. Give your signal some punch and try our antenna at no risk to you. Antena specs are as follows. Approximate height is 9 feet (depends on frequency). Wavelength is 3/4 wave. Gain over half wave dipole is better then 6 dbd. Power handling capacity is 1 KW on the standard model (2.5 KW with $50 upgrade) and 10 KW on the special order high power version. Bandwidth is 5 MHz. wide with a perfect 1:1 SWR at the center tuned frequency. Wind survival is greater then 100 MPH. Wind load is .7 square feet. Weight is 8 pounds. Radiation pattern is low angle omni with vertical polarization. Antenna is DC grounded for excellent lightning protection. 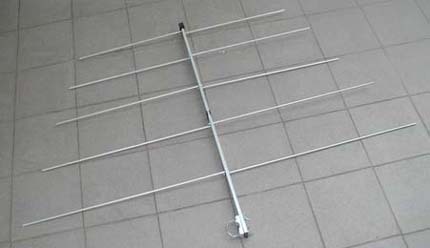 The CD95Y FM Yagi antenna from Creative Design provides 6 dB of forward gain in a highly directional pattern with a 20 MHz bandwidth. That means NO-TUNING is required from 88-108MHz. Typical SWR is <1.5:1 across the band. Handles up to 500 watts. Can be mounted horizontally or vertically. Provides a front to back ratio of >15dB! Employs DC grounding for superior lightning protection. Constructed of high grade aluminum for excellent weather resistance. Comes with an RG-8/U pigtail feed-line with S0-239 and mounting hardware. Includes 1 year warranty. SWR 1.5 : 1 Max. The model MLB-6600 is a quarter wave antenna for use on the 66 to 132 MHz bands. t provides superior performance for a variety of receive applications on the FM broadcast band while maintaining a 200 watt power rating for transmission. Comes with 18 feet of RG8 coax and PL-259 connector. Includes our exclusive 30-day money back guarantee and full 1 year warranty. Precise manufacturing, excellent technical characteristics and no-tune wideband operation make this log-periodical aerial a recommended aerial for all FM MAX transmitters. Remember that this is a 6-element directional aerial, meaning it radiates most of the power in one direction. This is where amplification comes from.